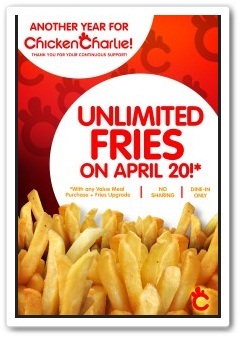 Come celebrate with Chicken Charlie and enjoy unlimited fries TODAY, APRIL 20, 2012! I have not eaten yet at Chicken Charlie so this is a great opportunity for me to eat there and enjoy its anniversary promo! I heard from a friend that Chicken Charlie’s French fries are real potatoes! Yes, I am so excited when I saw this promo because I simply love French Fries! This is not a paid post. I just believe this is a great deal, don't you agree?